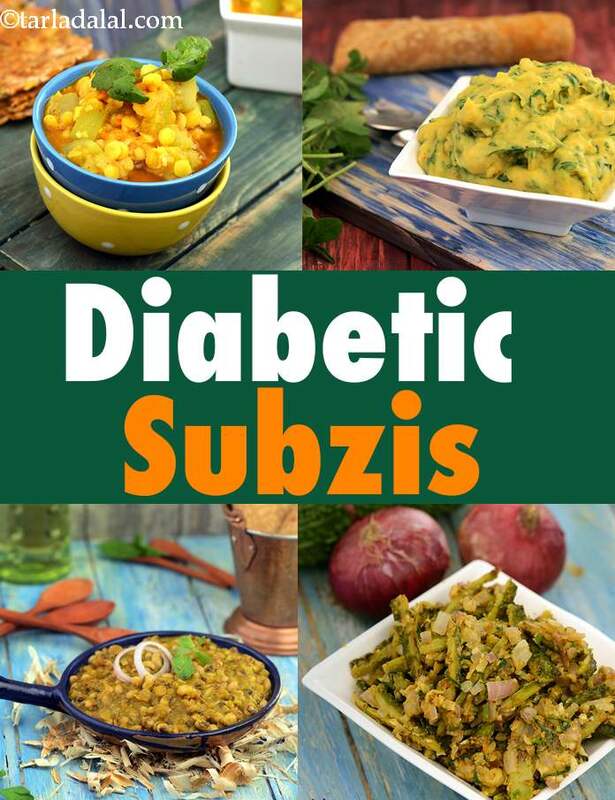 Diabetic Subzi Recipes, Diabetic Indian Vegetable Recipes collection. Diabetics often abstain from having rich gravies and subzis, which is right. But, when you remove the 'richness' from the formula, it becomes a tasty, no-guilt fare that you can thoroughly enjoy! This section features a bunch of such subzis, from gravies to dry and from north Indian to south Indian, some of which are made using common ingredients while some using uncommon ones. The commonality is that all these are suitable for a diabetic meal! Get ready to alter your cooking habits, so that you can make nutritious and wholesome subzis that will help you stay fit and keep blood sugar in control - all in an irresistibly tasty way! What you should restrict in Diabetic Subzis? 5. Use only one source of protein in your meals. We don't want too much protein for Diabetics. 6. Avoid starchy vegetables like potatoes, yam and purple yam. Diabetics should avoid or severely restrict full fat paneer from their diet as we want to cut fat levels for them. We have a few diabetic low fat paneer recipes here for you to enjoy. We have steamed our koftas in palak paneer koftas in makhani gravy. Cauliflower is high in fibre and used well in cauliflower paneer subzi recipe. A nice gravy based option is paneer lababdar recipe which also works for those with high cholesterol. Bhindi is a low glycemic index food and used well in dahi bhindi ki subzi recipe. For yellow moong dal lovers there is methi moong dal subzi recipe. Methi help in improving glucose and insulin responses and good for diabetics. A Bengali favourite which is cooked in lots of oil has been converted to diabetic baingan bhaja recipe. Low fat paneer and lauki combine well in bharwa lauki recipe with a tomato gravy. For chawli lovers try the masala chawli recipe. Looking for a calcium rice subzi, the option is khumbh palak recipe. What should diabetics have in their subzis? 4. Tons of fibre from vegetables. Check Recipes using Bhindi, Recipes using cauliflower, Recipes using mushrooms, Recipes using green peas, Recipes using methi, Recipes using palak and Recipes using Karela.